The IN Series fishing scale is one of our most popular linear scales. They are ideal for weighing fish, testing your line or setting your drag. They are also the universal choice for home, educational and industrial use where accuracy and ruggedness are required. The IN Series fishing scale feature a heavy-gauge solid brass construction with precision steel springs for outstanding reliability and diverse applications. U.S. Govt. Fish & Wildlife Service. The scale has avoirdupois and metric graduations that are deeply embossed for easy reading. A zero/tare knob is standard. 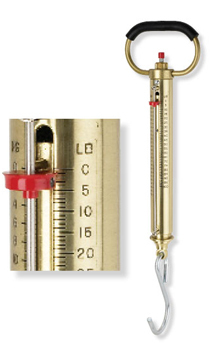 Scales comes with a fixed holding loop and large open hook. A maximum reading pointer is optional. The IN Series may be certified by the IGFA.